2. It is unclear to me why is ANI and R1a1a are treated as equivalent. If I understand your post here (and from your previous ones) ANI arrived long before ~4k BP but the latest admixture event is at ~4K BP per Moorjani et al. But R1a1a was distinct from other R1a around that time. So, the latest ANI arrival could be R1a1a but that doesn’t mean there wasn’t any ANI before, did I get it right? 3. Did all of R1a1a arrived at once in India? It is clear that there were a lot of people pushing through Kyber and Bolan passes and landed in India until Vasco de Gama figured out another way. So, how was R1a1a spread is considered to end at ~4k BP and not continue up to the historical period (or even due to Islamic rule)? This is the confusing part for me, as it appears that ANI –> 10k-4k BP arrivals, and R1a1a –> 4k-500 BP arrivals (including Islamic invasions which are male dominated). How does one know R1a1a in present populations didn’t come at a later date, particularly if they are mixing with their own ancestors who were mixed at an earlier date? No, the statement by journalist in old article was wrong. Here is what the geneticists K. Thangaraj and Chaubey replayed to that journalists article. “India is a nation of close to 4,700 ethnic populations, including socially stratified communities, many of which have maintained endogamy (marrying within the community) for thousands of years, and these have been hardly sampled in the Y chromosome analysis led by Silva et al., and so do not provide an accurate characterisation of the R1a frequencies in India (several tribal populations carry substantial frequency of haplogroup R1a). Equally important to understand is that the Y chromosome phylogeny suffered genetic drift (lineage loss), and thus there is a greater chance to lose less frequent R1a branches, if one concentrates only on specific populations, keeping in mind the high level of endogamy of the Subcontinent. These are extremely important factors one should consider before making any strong conclusions related to Indian populations. The statement made by Silva et al. that 17.5% of Indians carry R1a haplogroup actually means that 17.5% of the samples analysed by them (those who live in U.K. and U.S.) carry R1a, not that 17.5% of Indians carry R1a! K. Thangaraj is with the CSIR-Centre for Cellular and Molecular Biology, Hyderabad and G. Chaubey is with the Estonian Biocentre in Tartu, Estonia. We will need ancient DNA to confirm various population movements. Yes, I have read Thangaraj and Chaubey’s article too. Their article points out the sampling issues but does not give out a total number. Wikipedia lists the sample sizes used and ratios of different Y-haplogroups in India for different population groups and eyeballing them didn’t lead me to think 60% was the norm. So, nobody else gave a reliable value of what is R1a1a % for the entire country and had to go with a published number. Perhaps there is a better source with good sampling that you know? the map is derived from data in the middle 2000s, so it might be out of date. R1a1a freq varies a lot, and the smoothing impacts it a great deal. so 60% might be too high. closer to 30% in the north indian plain seems about right. you got it right. i have long believed “ANI” combines very different populations, but populations which are genetically very close in comparison to ASI. at minimum there are two populations, ANI1 and ANI2. AN2 ~ 50% mixed from middle eastern population that is probably most eastern farmer + 50% eastern european hunter-gatherer (EHG) which is itself 25% western european hunter-gatherer + 25% ‘ancestral north european’ (or perhaps 1/3 vs. 2/3, can’t keep up). this pulse arrives between 2500 and 1500 bc? i think AN2 probably brought almost all the R1a in india, though there may have been some before, and some later (there are a few instances of ‘european’ R1a in india i think). outside of a few groups (bengalis, people on the himalayan fringe, and perhaps in parts of pakistan) it looks like the population genetic character of south asia was established by the time we get to history (mauryas). the other groups may have contributed some quanta (sakas, kushans, various turco-muslims), but not too much. this is clear when you look at north indian muslims; they’re about 95% indigenous. if muslims are like this, hindus are probably more so. notice that in the levant 85% of the ancestry is continuous to the early bronze age. this may be an extreme case, but it shows densely population societies can hit a critical mass. there seems to have been far less demographic disruption in southern europe than in northern europe, by the indo-europeans. i think that’s because societies were more complex in the south. in india the indus vally civ. may already have been multi-ethnic with indo-aryan and dravidian elements (and perhaps others?). its collapse seems to have triggered massive migrations and demographic flux. as for later r1a1a, clearly indigenous groups like tam brahms and south india dalits have appreciable levels of r1a. this seems likely to predate muslims. also, i don’t think any indian r1a clusters with altaic r1a, which is what the turks would be bringing. Lazaridie et al 2016 study clearly states Eastern European Hunter-Gatherers (EHG) are 75% ANE, a population on Onge->Han cline. Thanks so much for clarifying my questions. Your detail really helped me put together what was going on with different publications over these past two years. Sometimes these things only make sense if you play with PCA and all the data. That’s why I appreciated the plot with Iran_Neo and Yamnaya and all the populations plotted on it. 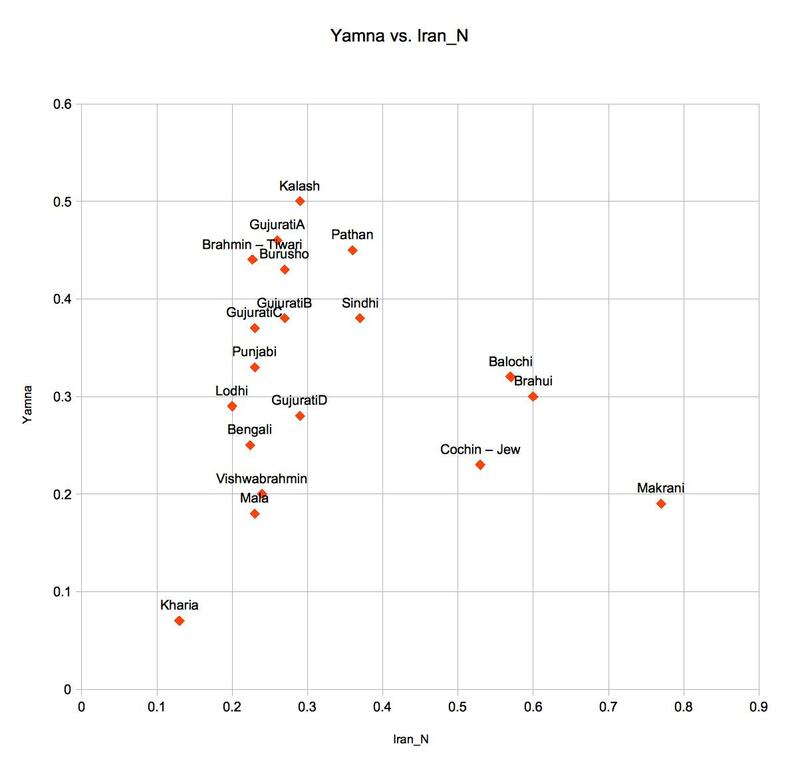 It helped a lot to see that Mala, Gujarati and North Brahmin on almost a straight line at ~20% Iran_N. Also, thanks for the explanation about R1a1a. Now I understand why R1a1a is tied with Yamnaya arrival and not later ones. I wish more was done to understand ASI in such detail. also, remember we are basing this on sample we have. most people assume that the ‘real’ source pops may be somewhat different in a lot of the details. we just pick the ‘closest’ we can find. Isn’t this arguing against the conventional Aryan Migration Theory (see wikipedia)? AMT posits that Indo-Aryans migrated to India from BMAC after 1800 BC. According to AMT, the Indo-Iranians of Sintashta (2000 BC) who were the inventors of the war chariot moved into BMAC around 2000-1800 BC and borrowed some of their religious practices and split into Indo-Aryans and Iranians. The Indo-Aryans then migrated to both India and Syria (Mittani). 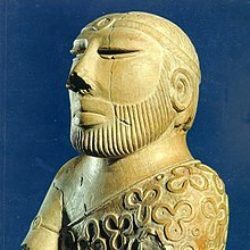 If Indus valley (3300-2000 BC) is already a mixture of Indo-Aryans and Dravidians doesn’t this take the current AMT out of the picture? 1. How does one know that the AN2 migration as you put it in your reply was mostly male? Couldn’t it be that equal numbers of males and females arrived but thanks to polygyny those males left a far wider genetic imprint than their females? Under this hypothesis, the number of people who arrived should be much smaller than naively suggested by the percentage of R1a1a among modern Indians. 2. 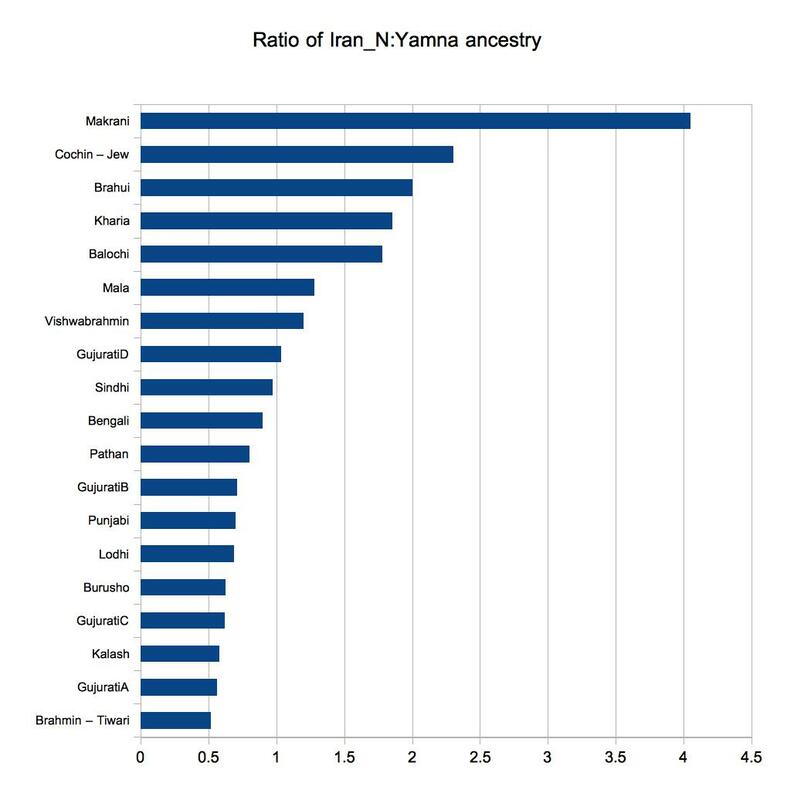 If it is not exactly clear in what proportion to model ANI (Yamna vs near east) what does “percentage of ANI ancestry” mean? And is this notion defined using Y-chromosomal or autosomal data? 3. Do you think R1a1a accounts for all the Y-chromosomes of the AN2, or would you expect middle eastern Y-groups to have arrived along with them? 4. Can’t our picture of how many migrated be skewed by something like how upper classes in Europe survived famines/plagues there better? Especially considering the aridization of the Thar desert? Of course, this possibility applies only if the AN2 fellows came during the mature Harappan phase and became elites in the society; say due to skin color or poetry or so. Then there can be the “germs” of the “guns, germs and steel”. 5. Is it known how many dead Indus guys are being sampled either in the forthcoming paper or the larger investigation to follow; at least, is it likely to be statistically significant? I ask because I remember reading that archaeologists had found (long back) many different kinds of skeletons in Harappa. 6. The bit in your reply about the genetic characteristics of Indians having been fixed 2000 years ago: reminds me of Arrian of Xenophon: “The appearance of the inhabitants, too, is not so far different in India and Ethiopia; the southern Indians resemble the Ethiopians a good deal, and, are black of countenance, and their hair black also, only they are not as snub-nosed or so woolly-haired as the Ethiopians; but the northern Indians are most like the Egyptians in appearance.” I wonder if the present day Indians would be described this way. 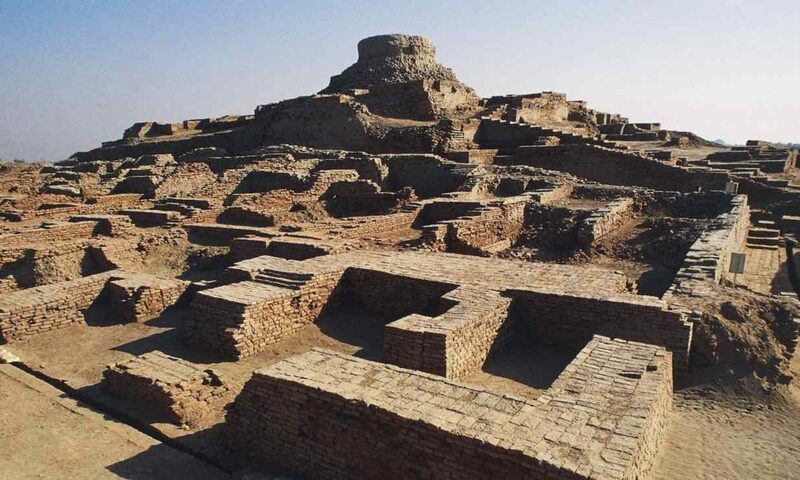 (a) During the mature Harappan era, say 2300 BC, refugees from war-torn cultures visit Harappa. (b) The Harappan liberals of the time support the migration saying that Harappa was built by migrants from the near east who introduced revolutionary farming technologies. (c) Gradually the migrants “Eurabianize” Harappa and the civilization goes to ruin, while keeping the language and cultural values of the invaders :P). not going to be statistical sig. from what i know. this is a first pass, won’t ‘resolve’ anything IMO. re: most of your demographic questions, it is a genetic assumption that large % of each generation will not reproduce. high levels of polygyny would probably be evident in the genetics low (low effec pop size). i don’t think they see that. Thank you for both the explanations. I have mentioned before, on Razib’s blog when he was at Unz.com , that I think Dravidians were also an ANI group because non Brahmin South Indians have ANI but not the North East European component that is found in Brahmins and North Indians. My hunch is the Aryans came in at the tail end of the Indus Civ. and contributed to its collapse, but natural factors would have also played a role. The Spanish did destroy Mayan culture but Mayans moved away from their cities well before the Spaniards arrived (classic Maya collapse). The estimated time of arrival of the Aryans and the collapse of the IVC is too close to be coincidental. The older Indology books did mention that Aryans conquered cities inhabited by dark skinned snub nosed short people who spoke a foreign tongue, but that they also found some people who looked like them, and they tried to live in the cities but ultimately gave up and abandoned them. The most plausible scenario is a gradual intrusion , colonization and assimilation ; somewhat akin to colonization of the Americas by Europeans. There could have been an Indo-Iranian group that entered South Asia before the Aryans, just as Vikings landed in Newfoundland before the Pilgrims arrived in N.E. America. In Iran we see that the Indo-Iranians did not wipe out the Elamite, instead Elamite continued to be spoken even after Indo-Iranians conquered the region but eventually it ceased existing. Same with the Akkadian conquest of Sumeria, where Sumerian continued to be spoken for awhile. Brahui used to be spoken in Sistan & Balochistan until late last century; last I read Brahui speakers (in Iran) switched over to Balochi. t I think Dravidians were also an ANI group because non Brahmin South Indians have ANI but not the North East European component that is found in Brahmins and North Indians. there isn’t consensus whether sumerian or akkadian (semitic) was earlier in mesopatamia. the earliest written records indicate semites were already there, even as kings. there is the thesis that brahui are medieval migrants from south india. there is no genetic evidence for this though. so if they are recent, they have been totally absorbed genetically. (i think if they were present in sistan they are not recent). I highly doubt Mesolithic South Asians will be “isolated” group. I’m certain they will already be admixed forgers on ASI-ANE cline. There are many Brahui speakers in Pakistani Balochistan and settled in Sindh province for some time. They related surname is usually written in English as Brohi. Look at ancient Egypt, it is located on the Nile river delta and a bit of the lower stem of the river. Look at the ancient mesopotamia, it is centred around junction of Eptatretus and Tigris rivers. The first one I would call as distributary civilisation, as it was located close to the delta. Ancient mesopotamia was on the other hand was a tributary river valley civilisation. Indus and the Saraswathi; both had a large number of tributaries and a significant delta with a long stem separating the deltaic region with the tributary region to the north. Two separate sets of civilisation developed, one in the deltaic region (Sind and Gujarat state of India) and the other in the tributary region (Punjab, Haryana). If in prehistory Saraswati was a much larger river than Sindu, with its delta at the rann of kutch, it makes pretty much sence. Both the above civilisations had ANI and ASI in different proportions, one more ASI than the other. Both of them traded and imported ideas from one other, while speaking in languages from different language families (Dravidian and Indo-Aryan). Slowly the Indo Aryan language become more prominent and the delta population also adopted it. Dravidian language got confined to the then dravidian back waters of south India. 1) Gujarat and Maharashtra brahmins being classified among Pancha dravida by the ancient Indians. 2) Grandeur of river Saraswati in the vedas, as the largest of all rivers. 3) Artificial nature of Classical Sanskrit, it was probably a language developed by using some scientific method of classification of sound, grammar etc. to create a unifying language for both Dravidian and Indo- Aryan languages. It also explains presence of Dravidian root words in Sanskrit. 4) Easy explanation for the presence of Brahui language in Baluchistan, as the area is contiguous to the delta area of Sindhu and Saraswati rivers (Pancha Dravida areas). 5) There were two ANI entry points one from eastern Europe and steppes into tributary portion of the rivers. Another one on the coast into Sind and Gujarat, from Iran and the middle east. 6) More migration happened from tributary areas of the rivers in the north to delta areas on the south at a later date. 7) The migration into india from the steppes continued for much longer time to the tributary (northern) region of the river valley. 8) Also note that ancient Egypt had upper and lower Egypt and they were unified later. What is your opinion Razib? How does it gel with genetics? Any idea how old they are ? If the aDNA is from the late phase of IVC, from early 2nd millenium BC or very late 3rd millenium BC, I would not be surprised to find these is some R1a1a. Would need aDNA from 2500bc (supposed to haven been when IVC reached its height) and earlier to form a picture that is far less misleading than aDNA from just before the collapse. Yes the linguisitc argument is that since they don’t have Avestan input, they were later migrants from the subcontinent proper. The genetic analysis I recal from Zack’s blog shows them to have less of the South Asian component than the neighboring Baloch, which conflicts with the theory they are post Avestan migrants from peninsula India. I do recal reading here on BP, that some Brahui are actually just assimilated Baloch. The Brahui were dominant near Kalat at at time, being rulers/Khans of Kalat. Back in the late 90s/ 00s I read a little excerpt in a travel guide book on Pakistan that stated the Brahui recalled coming from Aleppo. This was confusing to me because I had never read this anywhere else. Some years later I read that the Baloch came from Aleppo, and that’s when I realized that the source of the Brahui claims in the travel guide book must have been a Baloch who assimilated . DNA testing from Brahui graves would be something to look forward to. agreed, Brahui look like assimilated Baloch, however they along with lower-caste Punjabis and Sindhis have the highest iranian farmer element according to Zack Ajmals admixture plot. 1.Lower caste groups, especially from South India. In all these postings I see plenty of usage of the word “Indo-aryan”, this (Iran_N ancestry) seems to indicate the other group in India, “indo-dravidians”. Not only does this give more credence to a dravidian type ancestry stretching from Elam to India, but also bolstering theories of the original inhabitants of the IVC. I see plenty of responses from the hindutva/OIT leaning persuasion, and accusations from some of these posters about the a supposedly vociferous dravidian nationalist element from the south, but I have heard nary a peep from this other group (so called dravidian nationalists). I’d like to hear also about dravidians as well, as they are the other major component of Indian ancestry that seems to be either ignored or attacked for having their identity. My questions again relate only to the Dravidian ancestry, whether they were dark skinned or light skinned is irrelevant. To borrow from Razib’s designation, ANI2 is Indo-Aryan and ANI1 is Dravidian. I share the theory that Razib has (at least that’s what I think I read) in that as Dravidians spread through India, the more south they went the more ASI they picked up. As Indo-aryans (ANI2) spread through India, they picked up more of the ANI1+ASI, albeit depending on the region more ANI than ASI, and became ANI2/ANI1/ASI, while Dravidians were ANI1/ASI. Also from my religious following of Razib Khan’s excellent articles and blog site, I have also inferred that there are whole regions of India that experienced elite language dominance where only the top 1 or 2 upper castes show the Indo-Aryan signature but the majority of population is actually the Dravidian groups that originally lived there (i.e. Gujarat, Maharashtra, Bengal, etc) though they speak an Indo-Aryan language today. I actually would like to know the story of every different ancestry in India, Austronesian, Tibeto-Burman and the oldest one and most mysterious, the ASI. Hello, I’m a handle named “historumsi” in the webpage from Historum that you linked to in another comment of yours. Let me comment about some of the current linguistic hypotheses. 1. Mainstream: Dravidian family is isolate, Elamite is isolate, IVC language in the seals not known because the script is not deciphered. 2. Michael Witzel (philologist)’s view of IVC spoken language: Could not have been Dravidian. He called it Kubha-Vipas substrate (which he considers is of a prefixing nature and possibly related to the Munda family of languages) by studying substratum in the earliest parts of Rigveda. He also argued at some point that the IVC seals might not have been showing a written script (which I read shows the language in question seems to be a suffixing type- that’s why the tenuous connection to Dravidian after all, with no linguistic data present at all to analyse) at all, but mainstream thinks the IVC seals to have shown a legitimate script. So the point I was trying to make is, most linguistics-based hypotheses at least (including the extremely peripheral hypotheses like the third one, the peripherality of which I think I can never stress enough (at least under the current situation)) do not imagine a common cultural link between the Mature IVC people and the Dravidians (except of course, Asko Parpola’s views of which you might be aware (the fish, star connection particularly)). 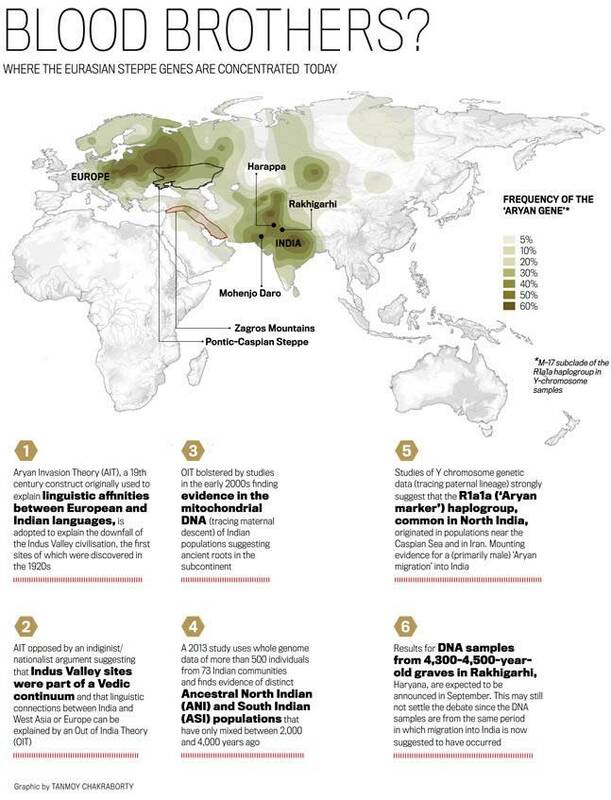 So the “Dravidian type” ancestry in the Elam-Tamil Nadu belt may be just an indication of an ancient genetic connection with no cultural participation of Dravidian groups in the founding and development of the Indus Valley Civilisation. Also, in my view the “Dravidian nationalists” are not a particularly productive group as compared to their extreme right wing Hindutvavadi counterparts because of what I perceive as a fundamental difference of worldview between Dravidian civilisation and the Indo-Aryan one (though they were both initially mainly cattle-pastoralists (going by Southworth’s 2007 “Proto-Dravidian Agriculture”)- this wildly superficial similarity is that wildly superficial). While the Indo-Aryan civilisation has steadfastly adhered to its original traditions through all means possible (one of the most powerful manifestations of this attitude has to be the errorless transmission of their sacred texts solely through oral medium for more than a thousand years or so before putting them to writing), the Dravidian civilisation (like most other civilisations I think) attached a far lower attachment to traditions and identities. Take for example, the Ashmounds of the Neolithic in South India, created by burning huge heaps of cow dung to high temperatures. They are thought of by most archaeologists to have been of some kind of social and ritual significance for the Neolithic people. (I’m going here by the hypothesis that the Neolithic Complexes of South India were created by the Late Proto-Dravidian speech community – based on Southworth’s 2007 view in “Proto-Dravidian Agriculture”). But modern Dravidians living in the nearby places think of them as ashes of cremated rakshasas (demons) (not to mention that many Dravidians are not even aware of their existence). Then the religion of megalithism. A form of ancestor worship by erecting huge megaliths in their name. Dravidians in many places think of them as “demon-stones” though many like Tamils and Kannada people retain right memories of them as “vIrakal” or “warrior-stones”. And we know of the extreme impact that Indo-Aryan culture had/ and continues to have on the Dravidian culture. So “Dravidian nationalists” don’t have much now to get nationalised-up anyway. At least not to the scale of the Indo-Aryans. And I somehow think Dravidians are not fundamentally inclined to this particular sort of nationalistic worldview (if the little to no resistance towards westernisation and anglicisation in Dravidians in modern times is any indication of another manifestation of that consistent fluidity and pragmatism). For your information, farmers in north Karnataka still grow wheat for their home consumption, on a small scale. though it commercially not viable to sell it in the market. I was discussing most of what I did under the consideration that the 2800 BC – 1000 BC Southern Neolithic Ashmound Tradition’s earliest phases represented Proto-Dravidian speech community. I mentioned this too, in my original post. And it is clear from the archaeological record that all sorts of wheats and barleys were absent from the earliest phases of the Southern Neolithic. Wheat and barley first appear in Southern Neolithic around 2000 BC via Deccan Chalcolithic cultures of the Northern Deccan who got their wheat and barley from Harappan civilisation and they appear to have gradual and not drastic impact on the overall culture there. It is under this sort of scenario that it becomes necessary to explain why the Dravidians did not begin agriculture with wheat and barley if they were recent migrants from the Indus Valley or Iran or whatever. That’s why, Professor Southworth had to explain it off as a result of winter crops not growing in southern Deccan and all that. Anyway, I clearly invoked Prof. Southworth and David McAlpin when I wrote the “crops would not have grown and knowledge lost” stuff. If you want to entertain the notion that the Dravidian speakers had and also utilised the knowledge of wheat cultivation from the get go, then you can only begin to associate them with perhaps the post 2000 BC of the Southern Neolithic. Which is fine; you can do that, as what other models outshine this particular model? All are just speculations. It’s going to be an eternity of murkiness regarding the origins of Dravidian languages anyway. I never for a moment thought the good people of North Karnataka or other South Indians in general don’t know how to grow wheat. After all, some of the people of North Karnataka were part of the cultural unit that I myself belong to, in several hundred years of recent history. Anyway, very good to know about this intimate little aspect of the lives of the people of North Karnataka- the connoisseurs of both the classical music systems of India; how great North Karnataka really is! the land of hampi, paTTadakallu, Bhimsen Joshi, Ganayogi Panchakshara Gawai and Ambakka Aai (the paternal grandmother of Sudha Murthy) after all. Razib, i disagree with your quote ‘It is true we are Lords of the Steppe and destined to drive our enemies before us’ R1a- indian version z93 is hardly successful outside India and pockets in Central Asia. Excellent points Razib. I agree with a lot of what you say. You also are not biased like other bloggers like David at Eurogenes, who seem hell bent on white washing everything within a Eurocentric frame. I think your intuition is sound, Steppe ancestry is definitely overestimated as per my models. The only thing I disagree with is what I consider “Indic” culture , I would saw a lot of the South Indians have significant continuity culturally with the Dravidian Bronze Age . I can say that based on how archaic tribal groups like the Toda and contemporary urban South Indians, there are a lot of similarities in their cultural mores and traditions.